Social Security benefits go a long way in securing the livelihoods of American retirees. The number of retired workers and dependents receiving Social Security benefits has climbed to 46.1 million in 2018, up from 41.6 million in 2008. On average, these retired beneficiaries receive more than $1,400 in Social Security income per month. According to the Social Security Administration, 48% of elderly married couples and 69% of elderly unmarried persons receive at least 50% of their income from Social Security. But looking to the future, the retirees of tomorrow may be forced to rely on themselves and their financial advisors. After all, the Social Security Trust Fund is expected to run out by 2034. Then, Social Security will be able to provide about 77% of benefits from ongoing contributions. With all that in mind, SmartAsset decided to analyze data to see how much savings you would need to retire in the event that you wanted to fund your entire retirement without Social Security. Below, we look at data on incomes, retirement expenses and other factors to estimate the total savings needed to retire without Social Security benefits. Check out our data and methodology below to see where we got our data and how we put it together to create our final rankings. Social Security makes a big difference - Not many people retire with more than $2 million in assets, yet that is what is called for in some of the most expensive cities if you don’t have Social Security to rely on. To retire in San Francisco, we estimate you would need more than $2.7 million to sustain your lifestyle for a 30-year retirement. Florida is your best bet - The Sunshine State has long been a destination spot for retirees fleeing the colder North. But more than just being a location with great weather, Florida also makes a ton of financial sense. Florida metro areas like Orlando, Miami and Tampa offer the most affordable landing spots in our study. Retiring in the San Francisco metro area has many perks. It ranks as one of the most livable parts of the country. Plus, the youthful, entrepreneurial energy pulsing through the region could keep any retiree feeling young. To the surprise of no one, though, retiring in San Francisco is expensive, especially if you are trying to retire without Social Security benefits. We estimate that a household looking to retire at 65 would need about $2.74 million saved up. In our model, that means saving nearly $3,200 per month from the age of 35 to 65. The area surrounding the nation’s capital may be another great place to retire. In fact, if you’re just looking for a livable city, Arlington is great. Plus, D.C. has some of the nation’s best museums and historical sites, enough to keep any retired household entertained. Retiring here will cost you, though. A household wanting to retire here without Social Security benefits would need to save about $3,100 a month from age 35 to 65. That will cover annual retirement expenses equal to $63,500, in 2018 dollars. And beware: Washington, D.C. is not the most retirement friendly area, as it taxes private pension income and distributions from retirement accounts as regular income. The area around Boston has a good mix of leisure options for retirees. In particular, Boston has a nice array of historical and cultural artifacts, while nearby beaches in Cape Cod and the mountains in New Hampshire offer outdoor entertainment. But before you start planning your retirement in Boston, you will need quite a lot of money saved up. We estimate the annual cost of retirement in Boston to be $54,600, before inflation. To afford that, you will need to save nearly $2,700 per month for about 30 years. Come 65, when you decide to retire, you will need about $2.3 million, assuming you don’t want to rely at all on Social Security. Seattle, along with its outlying metro area, is one of the most popular spots in the country for millennials. The Emerald city offers an attractive mix of job security and high incomes to many. However, if those same millennials moving there want to stay in retirement, they will need to be prepared. We estimate retirement expenses in Seattle will total about $52,360 per year, in 2018 dollars. To cover that in retirement without any help from Social Security, our model estimates you will need $2.1 million to last you 30 years. If you like the Mid-Atlantic lifestyle but don’t think the nation’s capital is for you, maybe the Baltimore area would suit you better. To retire here, though, you will need a sizable retirement pot. With retirement expenses equaling just over $49,300 per year in 2018 dollars, we estimate you will need a total of $2.1 million saved up to afford a 30-year retirement here. For seniors looking for an active retirement, the largest metro area in the Rocky Mountain State is certainly not a bad place to end up. Retiring in the Denver metro area is expensive, though. We estimate it will cost about $48,900 per year in 2018 dollars. For a secure retirement, without relying on Social Security, you will need over $2.08 million. One way to lower your retirement expenses would be to become a long-term homeowner. Colorado has some of the lowest property taxes in the nation. Many seniors head to warmer climes for retirement. Our analysis of the most popular retirement destinations included cities in Arizona and Florida. But not everyone has the same interests, and the often-frigid Minneapolis metro area has plenty to offer. To enjoy a retirement here to its fullest, you will need over $2 million saved up by the time you retire, according to our model. That is equal to saving $2,358 per month for 30 years while earning 4% returns. It’s tough to find a more exciting place to retire than the New York metro area. There are plenty of options when it comes to arts and culture, and when you decide to travel the world, you have access to four international airports. Retiring in New York, though, is expensive. We estimate that to retire here, you will need $48,047 per year. Keep in mind that number will rise in the future with inflation. To make sure you are self-reliant throughout retirement, our model estimates you will need just over $2 million saved. The San Diego-Carlsbad metro area has some of the best weather in the country. Year-round nice weather is a great first step for an enjoyable retirement. So what will it cost to retire in San Diego without any Social Security benefits? We estimate $2,030,752 should cover it. California has one of the highest retirement taxes in the country, which makes expensive San Diego even costlier to retire in. Finally, our list wraps up in the Pacific Northwest. In past research, we have found this area to be one of the best for an active retirement. This is both a walkable metro area and one packed with golf courses. 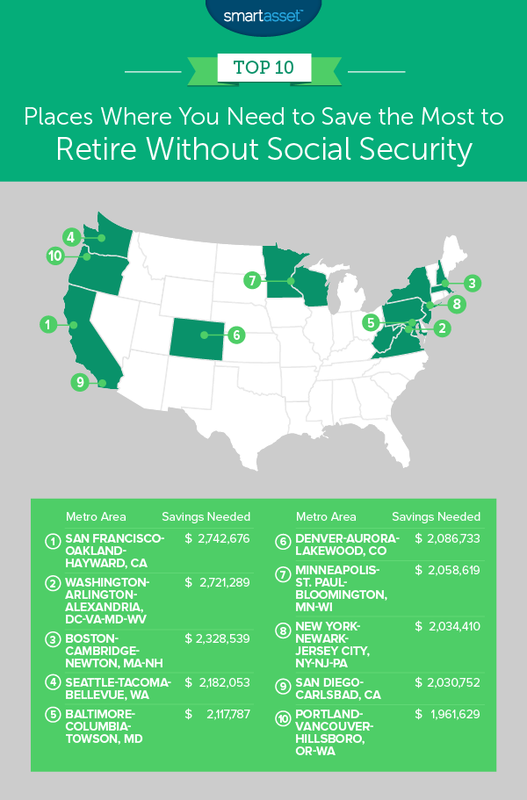 To fund a Portland metro area retirement without Social Security, we estimate you will need just shy of $2 million. That covers 30 years of retirement. To hit that figure, we estimate you will need to save $2,245 per month from age 35 to 65. Median household income. Data comes from the 2017 1-year American Community Survey. Estimated retirement expenses. To estimate retirement expenses, we assumed retirees would cut their spending in retirement by 25% of pre-retirement levels. This is in line with BLS spending data, which shows spending drops by about 25% in retirement. We assumed all non-retirement expenses to equal all money not saved. We then plugged median household income and estimated retirement expenses into SmartAsset’s retirement calculator. To finish the analysis, we also assumed a retired household would start with $10,000 in savings, see returns of 4% on its investments, face inflation of 2% and not take any Social Security benefits. Our calculator then estimated how much in savings a retired household would need to afford retirement and the subsequent savings rate needed to get there. We ranked the cities from highest to lowest based on the total amount of savings needed. Save early, save often - In our analysis above, we estimated households needed to save upwards of $3,000 per month to maintain their lifestyle in the most expensive metro areas. While not everyone can save that much a month, it's important to save as much as you can -- as early as possible. Thanks to the power of compound interest, saving money today and investing can be worth much more than saving and investing in 10 years. Ask an advisor - If you are looking to start off your retirement with a pot of $1 million or $2 million, you will probably want some expert advice. Why not ask a financial advisor? Such a professional can make sure your funds are invested in a way that makes the most sense for you. If you are not sure where to find a financial advisor, check out SmartAsset’s financial advisor matching tool. It will match you with up to three local financial advisors who fit your needs.